Pixologic announced ZBrushCore®, a streamlined version of ZBrush designed for all artists and enthusiasts of both traditional and digital art. 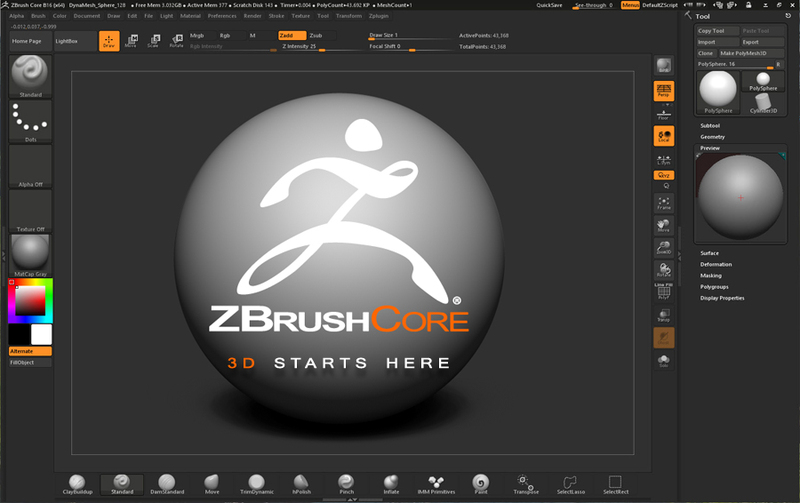 At its heart, ZBrushCore functions the same as ZBrush. Every skill and technique learned and applied in ZBrushCore will carry over seamlessly to ZBrush. The award winning ZBrush® is the leading software for professional sculptors, modelers and illustrators working in a variety of industries. ZBrushCore is designed for users who are new to 3D as well as illustrators, students and 3D printing enthusiasts. Pixologic will officially unveil ZBrushCore for both Windows® and Mac OS® during the ZBrush Summit starting September 30th, 2016. Founded in 1997, Pixologic Incorporated develops and markets innovative software tools for the film and video, games, graphic design and illustration markets. ZBrush is a graphic application aimed at simplifying the science behind generating computer graphics. ZBrush appeals to a wide audience by providing empowering tools that give users intuitive and visual control over the digital images they create.